It was expected that General Motors might make a major announcement Thursday, but it wasn't the one investors or the media had anticipated. Rather than details about the company's much-anticipated initial public offering of stock, those tuned into a GM conference call Thursday instead learned that Edward Whitacre would be stepping down as CEO effective Sept. 1 and as chairman as of Dec. 31. Fellow GM board member Daniel Akerson, managing director at the Carlisle Group, will assume both roles. Akerson was named to GM's board in July 2009 as a representative of the U.S. Treasury, which owns a 61% stake in GM. For four years he served as chief executive at XO Communications, but left the telecommunications company shortly after it filed for bankruptcy in 2002. Whitacre's tenure, which began as an interim post last December, was expected to be short-lived. In his trademark Texas drawl, Whitacre said the move was one that he and the board "had been contemplating literally since I joined GM," after the automaker emerged from a government-sponsored bankruptcy in July 2009. 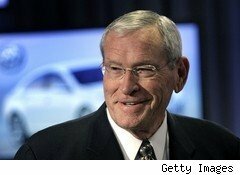 "At this stage of my career, it was obvious I was not going to be at GM for the long haul," said Whitacre, 68. The former AT&T (T) executive said his goal in joining GM was to restore the iconic company's long-lost luster and return it to profitability. "Today we are clearly on that path," said Whitacre, referencing the company's upbeat earnings report, released earlier in the day. In the second quarter, GM said it had net earnings of $1.3 billion on revenue of $33.2 billion, surpassing analyst expectations of a $1 billion profit. The automaker also said its North America operations sold more cars in the three months ending June than it did in the previous two quarters. Given the company's so-far positive momentum and recent management changes, Whitacre said he was "very comfortable with my timing." Whitacre noted that Akerson had played a key role in the decisions the board of the new company has made during the last year. "We've restored profitability. . . and things looks good," he said. For his part, Akerson, 61, thanked GM's board for their vote of confidence in naming him to the top posts. Mirroring Whitacre's comments, the former Naval cadet said, "We still have important work ahead of us, but I am confident that we are building the foundation for GM's long-term success." Still, Akerson said, with Whitacre still at the helm of the company it would be "premature for me to discuss my plans or vision for the future of GM." Despite Whitacre's surprising announcement, GM watchers still anticipate that the company may release details of its initial stock offer Friday. On Wednesday, numerous news reports surfaced that the company was pushing ahead with the deal to rid itself of government oversight. Reports suggest GM is looking to raise $12 billion to $16 billion in the offering. GM officials began Thursday's conference call, however, by noting that they wouldn't comment on an IPO. That didn't stop one beat reporter from slyly asking if he should refrain from taking Friday off as a vacation day, lest GM make any major announcements. Though amused by the reporter's clever inquiry, GM Chief Financial Officer Christopher Liddell nonetheless refused comment.